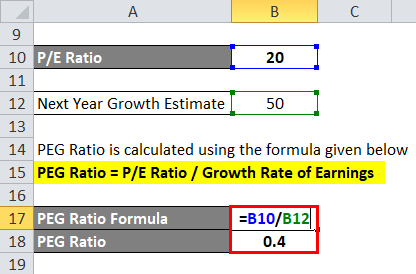 PEG Ratio Formula | How to Calculate Price Earnings to Growth? 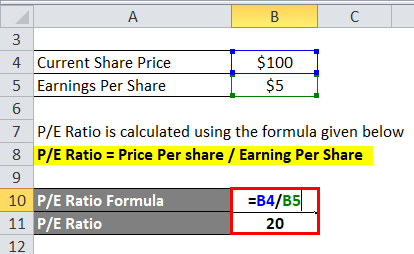 One of the easiest and quick way to see if a company is over or undervalued, compare its Price to Earnings (P/E) ratio with the P/E ratio of market and peers. If stock’s P/E ratio is greater than the market, the stock is more expensive and vice versa. But what if that company is growing at a much higher pace than the market. 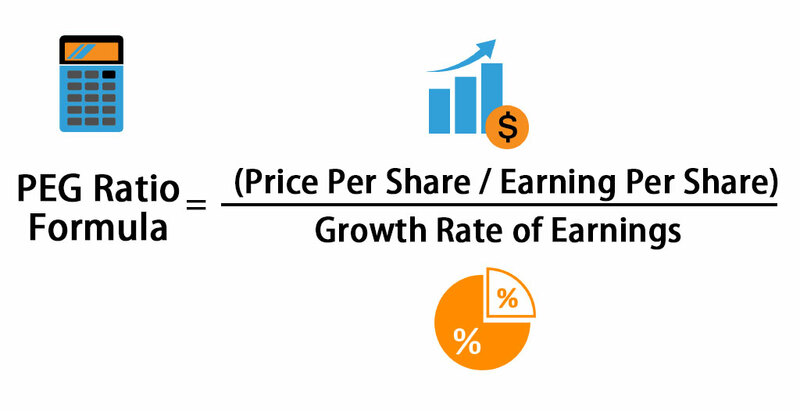 P/E ratio does not take into account the growth of the company and this is where PEG ratio, also known as Price Earnings to Growth ratio, comes into the picture. PEG ratio adjust the P/E ratio by taking into account the growth rate of the company and it is calculated by dividing the company’s P/E with its growth rate. We can say that the PEG ratio is an improved version of the P/E ratio as it also factors in the growth rate along with P/E ratio. P/E ratio alone will only tell us about the attractiveness of a stock today but it does not take into consideration the future growth rate and attractiveness of the stock. P/E ratio is relatively easy to calculate but we must be careful while determining the growth rate as it is not very simple as it seems. The problem here is that what growth rate shall we use, historical rate or expected future growth rate. So different investors will have different assumptions while calculating the growth rate which in turn cause a difference in calculated PEG ratio. Let’s take an example to understand the calculation of the PEG Ratio formula in a better manner. Consider a retail company X’s stock which is currently trading at say $100 per share in the market and its earnings per share (EPS) for the recent period is $5 per share. 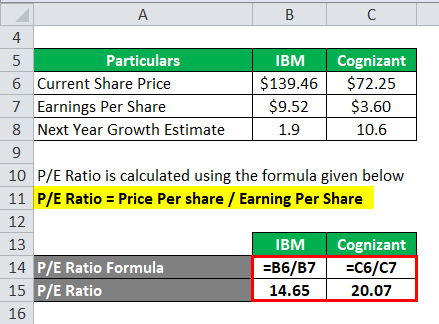 If you see here, the P/E ratio of Cognizant is higher than IBM. 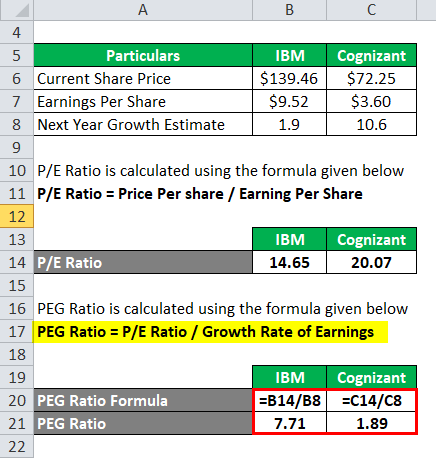 So if we only consider P/E parameter, Cognizant will be categorized as overvalued than IBM. But Cognizant is experiencing higher growth than IBM and is expected to grow by 10.6% whereas IBM is only expected to grow by 1.9%. So if we calculate their PEG ratio, Cognizant will be cheaper than IBM. Although both have PEG > 1, if we have to select a stock among these two, we will go for Cognizant based on PEG ratio. In this, the forward-looking growth rate is used. Future growth expectation is taken into consideration while deriving this number. This may be the case that different analysts take different assumptions and can end up with different PEG ratios. This method takes into consideration the historical growth rates of the company. This growth rate can be calculated by taking last year’s growth numbers to some average of the last few years’ performances. The PEG ratio enhances the P/E ratio by adding a growth into the calculation. It is used as an indicator of a stock’s real value. Lower PEG means a stock is undervalued and vice versa. In nutshell, PEG ratio formula is a metric which investors can use to gauge whether the stock which has high-growth may be undervalued, even if they don’t appear so with the more common P/E ratio. You can use the following PEG Ratio Calculator. How to Calculate Financial Leverage?